Magic is the most universal of all the arts. The same feats that baffle, enthral and delight audiences around the world have a fascinating evolving history. Mystery is the key element of magic and once the secret is revealed, the magic loses its appeal. Magicians are legitimate deceptionists and here we get a glimpse of the life of a unique conjuror in the history of magic, someone who was born without arms or legs. Matthias Burchinger was born in Anspach Germany on June 2nd 1674 and later became known as “The Little Man of Nuremberg”. He was married four times, had eleven or some say 14 children and is rumoured to have fathered more children with various mistresses. Not only was he an accomplished performer of magic tricks but became a musician and played the flute, trumpet, and dulcimer (A stringed instrument) and he was even said to have played the bagpipes. It was noted also that he was a good marksman with a pistol, yet he was only 28 inches high but became quite famous in his day with his magical and musical skills. 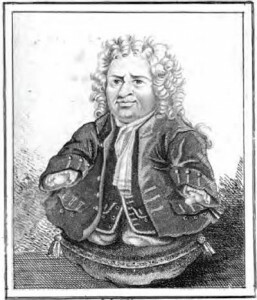 Another early 18th century German magician before Burchinger was Johannes Brigg who was born without legs and only one hand but also became an accomplished magician. Johannes acquired rare skill with the cups and balls and was also a musician. 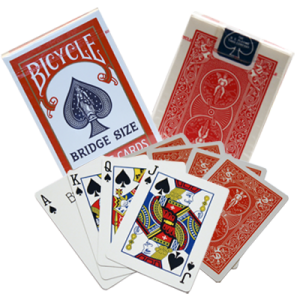 Briggs would perform balanced on a cushion behind his table, using his handless arm to move his conjuring props and his good right hand to perform the necessary sleights. He developed a technique that even two handed magicians envied. Despite his handicaps Matthias Burchinger had two fin like extremities which served as his hands through which he developed fine penmanship and calligraphy. He drew lovely scenes, landscapes, portraits, and coats of arms. He had a knack for card playing and dice games that became an asset when performing magic and he could actually shave himself. His charm and courteous manner endeared him to his audiences who soon forgot his infirmities focusing on his conjuring skill. Burchinger presented a nice version of the Cups and Balls that even some able bodied magicians struggle with. He produced live birds and performed card tricks and magic tricks using dice and small apparatus. When one stops to consider what this little man could do it becomes very apparent that Matthias Burchinger developed rather extraordinary talents. However even with his popularity there were those who would ridicule him with poems like this. I’m sure that’s the worst thing about his life’. There is an inscription inside the bottle, pictured at the left, which reads: “October ye 20 1719. 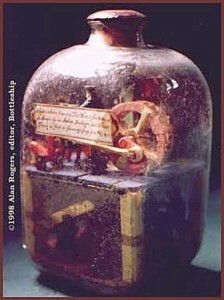 This Work in This Bottle was Mendet by me Mathew Burchinger, born Without Hands and feet in Jany ye 3 1674”. 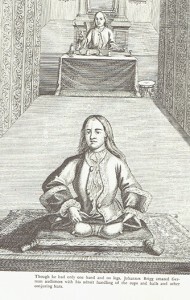 From a handbill dating from 1726. Burchinger became a skilled engraver that was influenced by his artistic talents and as a hobby he built tiny ships in bottles. He was even able to bowl a ball knocking down skittles. Womenfolk were said to be attracted to Matthias Burchinger although he had to put up with constant nagging and bullying from one of his wives till one day he snapped. He knocked her down, and then thrashed her in public. This was immortalized in caricature form and published in the newspaper the following day. The lesson to be learnt here is while all publicity is said to be good for a performer, this is perhaps going a little too far. These days it would be called Domestic Violence. His self-portrait (1674) is quite extraordinary for its fine detail. On close examination, his hair curls depict seven biblical psalms and the Lord’s Prayer neatly printed. Matthias Burchinger demonstrated his skills at many of Europe’s courts appearing before heads of states and royalty that included three successive kings of Germany. Around 1719 he decided to travel to England with hopes of performing before King George 1st but was unsuccessful. So he moved to Ireland and performed in Dublin in 1720 then in Belfast in 1722. He was well received throughout Ireland that enabled him and his family to live a nice ‘genteel life’. At his performances it was customary to sell his Indian ink sketches and drawings that was probably a forerunner to ‘back of room sales’ (BOR) familiar with many magicians. While in Dublin he was befriended by academics from famous Trinity College who found his company quite stimulating and entertaining. It is interesting to note that about 90 years before Burchinger was born saw the publication of the first known book about magic titled “The Discoverie of Witchcraft”. Written by Reginald Scot in 1584, it was an expose about witchcraft that was prevalent in those days and described a number of magic tricks and how they were done. It is regarded as the first known book about the art of magic. The Magic Circle in London has a copy and reprints are still available. “The little man of Nuremburg”, who won’t be forgotten in the rich and colourful history of magic, died in County Cork Ireland in 1740 aged 65. One lesson for us is that despite physical disabilities many people overcome their infirmities to achieve their fame and sometimes fortune, so we should perhaps count our blessings and be grateful we can entertain with magic as we do. A noted magician from Argentina, Rene Lavand was born with only one arm and became a superb sleight of hand performer carrying on the tradition by presenting the cups and balls and beautiful card magic. Lavand passed away earlier this year. Most of us have most of our faculties and are not physically impeded with major disabilities or infirmities and also have the gift to entertain with our magic. Footnote: In 2009 an anonymous post appeared by a gentleman who claimed that Matthias Burchinger was his wife’s great grandfather (7 times removed). Ancestry science suggests that music is in people’s genes and all the anonymous children of the couple mentioned are accomplished musicians and earn their living from music. (Unconfirmed).